President Trump on Tuesday commented on the tragic murder of college student Mollie Tibbetts after it was reported the suspect in the case is an illegal immigrant, saying it highlights the need for stricter immigration laws. "You heard about today with the illegal alien coming in, very sadly, from Mexico, and you saw what happened to that incredible, beautiful young woman. Should’ve never happened. Illegally in our country," he said at a rally in Charleston, West Virginia. "We’ve had a huge impact but the laws are so bad," he continued. "The immigration laws are such a disgrace. We’re getting them changed, but we have to get more Republicans." Cristhian Bahena Rivera, 24, who authorities said has been living illegally in the United States for at least four years, was charged with first degree murder. He admitted to seeing the 20-year-old running last month, approaching her and then following alongside her. Tibbetts told him to leave her alone, pulled out her phone to call the police, and then took off. He pursued her and told authorities he doesn’t remember what happened after that. As he was driving he saw headphones in his lap, which made him realize he put Tibbetts in the trunk of his car, the affidavit says. Rivera took law enforcement to the location of her body in a corn field. 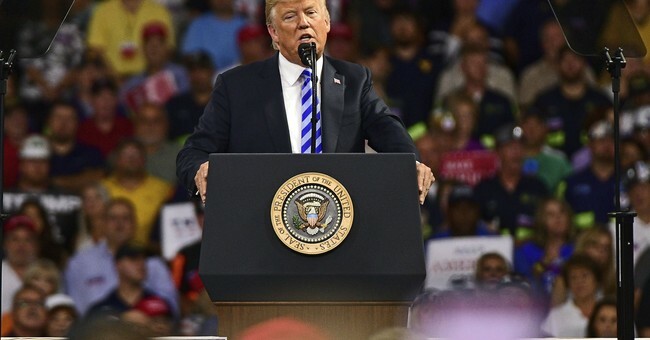 Trump was in West Virginia stumping for Senate candidate Patrick Morrissey, who is challenging incumbent Democratic Sen. Joe Manchin in November.